Rajasthan is one of the most visited states in India and when you look at all the things to do in Rajasthan it’s pretty easy to see why. From bustling colourful markets to ornately decorated palaces and forts. From golden sand deserts to stunning lakes there’s a something for everyone in Rajasthan. But what to see in Rajasthan and how to split your time between the many cities and attractions of this diverse part of India? Well, read on to find out the best Rajasthan itinerary for your trip. You will see a lot of colourful sarees when you independently travel Rajasthan. How long do you need to travel Rajasthan? How long have you got? This state is so much more than the big name cities that attract throngs of tourists each year and could be explored for months. But at the same time there are many quick-fire Rajasthan itinerary options which mean you can see some amazing cultural attractions in one week. I think that two weeks in Rajasthan would be perfect to see lots of Rajasthan attractions and also not be rushing from city to city every second day. The best time to visit Rajasthan is in winter, October to March. From March onwards the temperatures get very hot and almost unbearable for walking around attractions. July sees the start of heavy monsoons which last until around September. The people and the culture will add a lot of colour and interesting experiences to your rajasthan itinerary! Especially if you plan your Rajasthan itinerary for independent travel. Most cities in Rajasthan are well connected by both train and bus. For day journeys trains are more comfortable and easily bookable at train stations or using the 12Go website (which also shows photos of the different classes). Overnight, we prefer buses as they give a more private space and are more comfortable but everyone has their own preferences when it comes to overnight transport and let’s face it, none of it’s brilliant. We booked all our buses using the Red Bus app which is easy to use and shows most options. Train travels will be an interesting experience during your Rajasthan itinerary for independent travel. There is also the option to hire a driver and as a small group this may be more financially viable but for us budget backpackers this idea wasn’t even worth entertaining! I also wouldn’t recommend car hire unless you are familiar with driving on Indian roads. There are flights between cities and this may be necessary at the end of your trip to get back to Delhi or wherever your flight out is from. Almost every city in India has an airport and there are some good domestic airlines. We have used SpiceJet, Indigo and Jet Airways and had no problems. The accommodation in cities in Rajasthan is often of a higher standard due to the number of international tourists, at the same time it has its fair share of terrible options too. If you are on a higher budget there are nice hotels and guesthouses available on booking.com. If you’re travelling on a budget your best option is to turn up and ask around at some guesthouses for the best price. There are also some hostel chains in the area which offer affordable and decent accommodation. We had a great stay at Moustache Hostel Udaipur but the one in Pushkar wasn’t very good. We will recommend some options for each destination we talk about below. The Udaipur city palace is one of the best places to see in Rajasthan and definitely need to be added to your Rajasthan itinerary! This stunning palace is the jewel of Udaipur. Overlooking the lake on one side and the sprawling city on the other, you’ll spend as much of your time checking out the views and marvelling at the interior art. Spend a good couple of hours wandering the beautiful architecture and art in this incredible palace. Jodhpur Fort is a very beautiful old structure and is a must see place in Rajasthan. Rajasthan itinerary for independent travel! Travelling in Rajasthan can leave you a little bit tired of forts but the Jodhpur Fort is definitely worth a visit. It sits grandly on a hill overlooking the blue houses of Jodhpur and covers a huge area. There are gardens, a temple and even a zip line to be found while walking around. There was a Bollywood movie being filmed while we were there so there was lots of filming equipment set up around the fort which obscured the view slightly. But there was no denying the beauty of the fort and you should definitely factor in the time to visit in your Rajasthan itinerary. Can't miss place during your Rajasthan itinerary. This was a great place for exploring as the giant fort didn’t seem to have a set direction for visiting and there were many small passages, walkways and rooms to discover. There are some stunningly decorated parts as well as sandstone buildings and stone passageways. The fort is located about 20 minutes drive from the city and is one of the top things to do in Jaipur. One of the most beautiful places to see in Rajasthan. You will likely have seen photos of this before you arrive in Jaipur and it can’t be missed when in the city. The brilliant pink façade is studded with stained glass windows and is made of tiny viewing platforms originally made for royal ladies to be able to watch parades and festivals happening on the street without being seen. The view from the street is the main attraction but you can also enter the palace to see it from the inside. Udaipur has to be a stop on your Rajasthan itinerary for independent travel! Udaipur wouldn’t be City of Lakes without some picturesque lakes and Pichola is the central one. In the centre sits the Taj Lake Palace and the City Palace stands grandly on the east bank. The lake is particularly beautiful at sunset and tourists can enjoy the views from a boat. There are plenty of cafes and restaurants overlooking the lake so grab a chai and enjoy the view! Planning out your perfect Rajasthan itinerary will depend a lot on your preferences, how you want to travel around and how quickly you’re happy to move between places. So instead of telling you exactly where to go and what to do on each day here is some information about each city and roughly how long to spend there. Use this to decide what interests you and what you want to see whether you have two weeks in Rajasthan or two months! One of the best places to visit in Rajasthan, India. Jaipur is a beautiful historic town known as the Pink City due to the pinkish hue of the buildings in the city centre. There are several impressive things to see in Jaipur so it’s necessary to spend a few days here. The city itself is interesting to walk around and although busy and chaotic in usual Indian fashion it’s reasonably clean and safe. There are also great cafes and restaurants. Where to stay: We booked the private room at Lostouse Hostel. It was the most comfortable room we stayed in India! They also have nice dorm rooms and a great café/restaurant downstairs. Check prices here. If you prefer a hotel and want a double room with beautiful interior decoration try Pearl Palace Heritage. If you have enough time and like the hippy vibe Pushkar need to be on your Rajasthan itinerary. Pushkar is, by Indian standards, a small town famous for its lake which is a religious pilgrimage site. There is not a huge amount to do in the town but it is a popular stop for ‘hippy’ travellers and is a relatively peaceful place to be. The lake is the centre point in the town and there are several temples of different religious denominations dotted around the town. One of the temples stands on a hill overlooking the town which provides a good workout and some nice views. Travellers also enjoy the variety of food available in Pushkar particularly vegan food and Western staples such as pasta and salad. Where to stay: We don’t recommend Moustache Hostel due to the poor service and standard of cleanliness (even by Indian standards) but have been recommended Seventh Heaven by several people. Udaipur or the Lake city is one of the best places to see in Rajasthan. 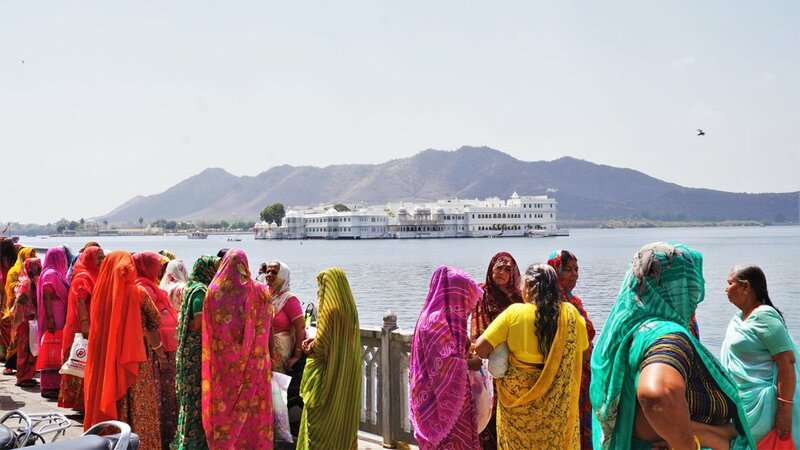 Udaipur is also known as the ‘City of Lakes’ and is, in my opinion, the prettiest city in Rajasthan. As in the name, Udaipur is set among beautiful artificial lakes which compliment the terraced housing and ornate palace buildings. Udaipur should be a top stop on your Rajasthan trip and we’ve even created a two-day itinerary for Udaipur with everything you need to see and do which you can read here. Where to stay: We loved our private room at Moustache Hostel and found the staff much more helpful than in the Pushkar branch. You can book here. Or for a more upmarket option try Madri Haveli. Rajasthan itinerary for independent travel! It seems like every town in Rajasthan has a nickname and Jodhpur is the ‘Blue City’ because of the, you guessed it, blue buildings in the town. 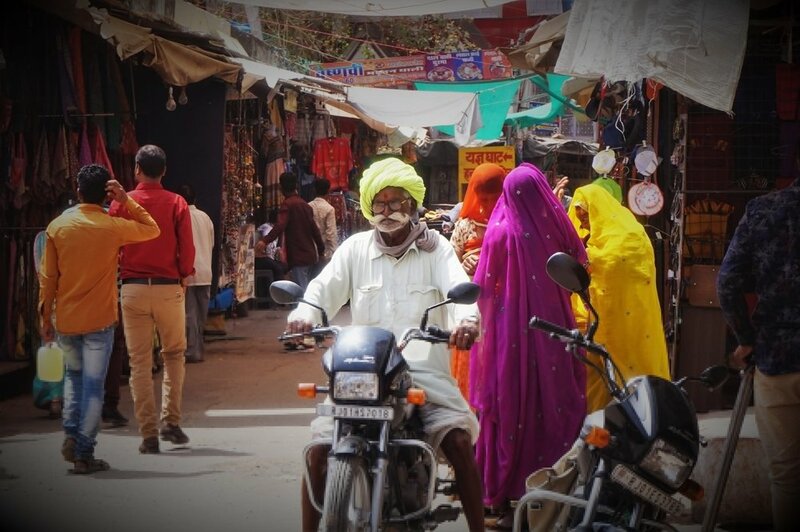 Jodhpur felt to us like a huge juxtaposition between local life and fancy tourist establishments. The bustling local market surrounding the clock tower and life in the nearby streets feels worlds away from the cafes and hotels built for tour groups on their quick-fire tours through Rajasthan. Make sure you reserve some time for wandering the blue streets of Jodhpur and look out for what’s on, I went to a great photography exhibition of local street life and we watched school kids jumping and swimming in the stepwell which made some cool photos. Put a stop in the desert town on your Rajasthan itinerary. This was the one city we missed off our Rajasthan itinerary purely because of timing. Jaisalmer is desert town located in the far west of India and is known as the ‘Golden City’. It is supposed to be beautiful and a great base for trips into the surrounding desert. You can stay in the old city area surrounding the fort where alleyways wind between golden sandstone buildings. I recommend finding an old haveli to stay in as these historical buildings are beautiful. Read this article for the best things to do in Jaisalmer. Where to stay: Check out some haveli houses here. The small town Bikaner is worth a stop during your Rajasthan itinerary if you want to see the real India away from the tourist crowds. We have mixed emotions about Bikaner. It was one of the dirtiest and smelliest cities we visited in India but there are some interesting areas to wander, it has a great fort and it feels much less touristy than some of the other cities in Rajasthan. The old haveli houses are really stunning to see and we found a little haven in the garden café next to the fort. Bikaner is a good place to continue onwards to Amritsar (there are direct overnight buses) if you plan to see the Golden Temple and Wagah Border Ceremony. Where to stay: Have a look for places to stay in Bikaner here. Your route through Rajasthan will totally depend on where you want to start and finish. We arrived from the south so began in Udaipur but many people will start and end in Delhi. I would recommend starting in Jaipur and looping back towards Delhi if this is the case. As you can see, there are so many things to do in Rajasthan and this just scratches the surface. But these stunning attractions and bustling cities will give you a good taste of one of India's most cultural and interesting states. Any other suggestions for places to visit in Rajasthan? Let us know in the comments.